PROGRESSIVISM IS BECOMING GREEN - After Benedict XVI blew the whistle to start the game of ecology at Loreto on Creation Day 2007 (last September 1), his team of Bishops entered the field. 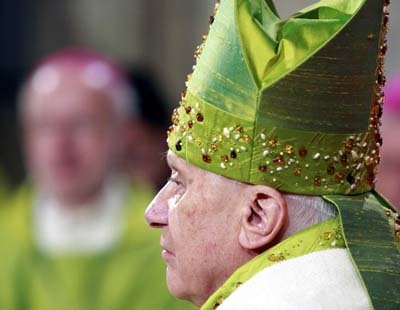 We remind readers that Pope Ratzinger, wearing green vestments, told the youth present that the “most urgent” responsibility of their generation was to protect the environment. He stressed that, “before it is too late, courageous choices must be adopted that are capable of recreating a strong alliance between humans and the Earth.” He also stressed that “there needs to be a decisive ‘yes’ in defense of creation and a strong commitment to reverse those trends that risk creating situations of irreparable degradation” (The Tablet, September 8, 2007, p. 28). Creation Day was an initiative of the Italian Conference of Bishops and has taken place three times since Ratzinger was chosen Pope. * The Vatican is preparing to install solar panels on the roof of Paul VI Hall to avoid the use of carbon-generated energy. Also officials have engaged an “eco-restoration” company to plant trees in a designated Vatican Climate Forest in order to counterbalance the emissions of carbon dioxide coming from Vatican City (ibid). * On September 24, Msgr. Pietro Parolin, a Vatican secretary for the Relations with States, declared that the international community had the responsibility to use the same method of intervention against countries that refuse to safeguard the environment as that which can be used against nations that commit atrocities against their own populations. “The Holy See believes that the right to protect applies also in the content of climate change,” Parolin affirmed (The Tablet, September 27, 2007, p. 34). This progressivist Vatican statement also could not leave out a word against Capitalism. Indeed, Parolin indirectly attacked it when he condemned the "fundamentally reckless approach” of those who, even "using a world-view supposedly based on faith,” believe "we should actually exploit our world to the full” (ibid). With such powerful examples coming from the Pope and the Vatican, it is no wonder that Bishops all over the world have begun to play in the same match. Fr. Benny Tuazon, Director of the Archdiocese Ecology Desk, gave a talk on how to raise the ecological consciousness of the people of Manila. In the homily of the final Mass, Bishop Broderick Pabillo, auxiliary Bishop of Manila, added his criticism of Capitalism. 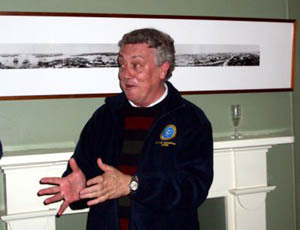 His words were directed against the government and the business community for “making money at the expense of people and the environment” (The Tablet, October 6, 2007, p. 33). * The newly installed Archbishop Leo Cornelio of Bhopal, India, made an unusual request of those who wanted to congratulate him on his appointment. He asked that they give him tree saplings. The Archbishop told UCA News	that he wanted to highlight the Church’s concern for the environment amid rising pollution levels and increased news of environmental destruction around the globe. He received around 10,000 saplings that will be planted in Catholic institutions. 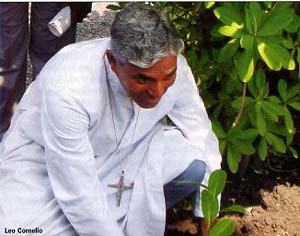 Officials of the State of Madhya Pradesh, whose capital is Bhopal, said Archbishop Cornelio’s decision had a powerful symbolic meaning, since the love of trees is part of Indian religion and mythology (America, October 8, 2007, p. 6). On September 29, Bishop Toohey attended a special Mass at Clifton Cathedral in Bristol to launch the Sound of Many Waters, a year-long chain of events focusing on the Catholic Church and ecology (The Tablet, October 6, 2007, p. 39). Toohey pretends that the Church has the mission to bring hope and joy to the ecological movement, which has been clouded by a “doom and gloom” mood. He claims the Church will bring to ecological efforts the needed “moral authority” that science lacks, and thus move people in the green direction. 1. It gives Pope Ratzinger a new chance to accomplish something significant for Progressivism. Indeed, given that so far he has been unsuccessful in resolving most of the problems he was assigned to settle regarding unity with other religions and unity inside of the Church, ecology diverts attention from his failures. It is an attempt to delay his probable resignation. Besides, Benedict’s boy scout look fits well with the green platform being prepared for him, insofar as his promoters can prevent photos revealing his Dracula gaze. 2. As far as I can see, in the late ‘80s Progressivism entered into an enormous crisis as its ideals lost their glamour and appeal. With his theatrical skills, Wojtyla managed to keep the people’s attention on the stage. The interest and amusement generated by the papal star, however, did not replace the ardor and idealism that used to exist. Some spectacular measures were taken to gain time, such as borrowing Protestant tactics to foster the Charismatic movement, and the adoption of Woodstock-style events to attract youth – the World Youth Days. The momentary success of such maneuvers, however, did not change the essence of the problem. They were temporary patches to give an extra life to a worn out fabric. After 20 years, those patches became worn in their turn. So, today the bosses of the Revolution in the Church have a worse problem: Progressivism does not attract; the Charismatic movement produces boneless priests and lay people, no one can build upon them, and the WYDs are falling into discredit. In this emergency, ecology seems to be a supplementary expedient to buy more time for Benedict. 3. One of Ratzinger’s still unaccomplished tasks is to attack Capitalism and its primary representative, the United States. He has already delivered some few speeches along these lines and an encyclical against Capitalism is said to be in the making. If this is so, this task will be done. But he has a better chance of a good accomplishment if ecology enters the picture to help. Benedict has the chance to attack Capitalism not only with the old Marxist jargon of “rich becoming richer and the poor becoming poorer,” but he can do so under the pretext of “saving the planet” from a supposedly unjust exploitation of the environment. These are just a few points to explain why Progressivism is becoming green. From this, one can surmise that when Benedict XVI visits the United Nations next Spring, there is a good possibility he will deliver a green message against Capitalism that may be cheered everywhere as a most timely issue.